Earlier this week I got a depressing call from a friend who was watching a bulldozer mow down the Ranch Acres Medical Building. For many years this ranch-style building has been a fixture on the corner of 31st & Harvard in Tulsa. I knew the building had been empty for a while. But outwardly it appeared to be in solid shape, despite the beautiful brick being molested with paint several years ago. Today the two-story structure is laid bare and it appears it was inwardly pretty solid also. Watching all that nice hardware head to the landfill just makes my heart sink. Most of the original retail and commercial structures at this intersection were built alongside the residential development of Ranch Acres neighborhood. Principally bounded by 31st and 41st Strreets between Harvard and Delaware, this well-preserved area was built during a time when commercial and residential buildings shared a look and feel. The corner store looked like your house. They matched. At one time nearly the entire intersection of 31st & Harvard was a showcase for crab orchard sandstone and cedar shake shingles. All of these buildings were designed in a similar style and scale to the homes in the nearby Ranch Acres development. An earlier medical center just across the street was mowed down to make way for a Walgreens. 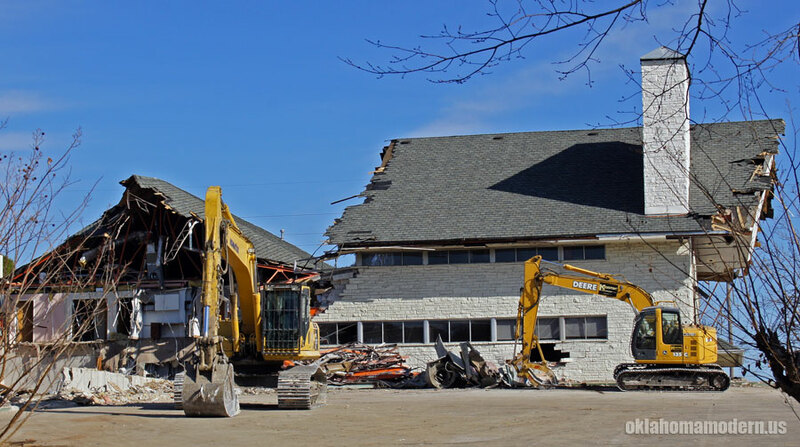 The building being torn down today looks like an overgrown ranch house transplanted from the neighborhood. Soon the Ranch Acres Shopping Center will be the only commercial survivor of the original development. 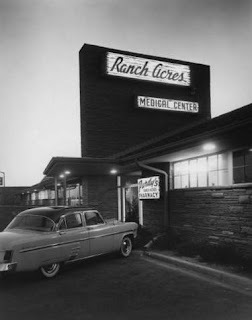 Initially developed in the early Fifties as an upscale residential area, Ranch Acres is one of the best preserved examples of post-war suburbia in Oklahoma. The low and sprawling ranch-style homes occupy large lots- as the name implies, about an acre. But this well kept neighborhood, its central location and the large parcels of land were slowly becoming a liability. By the Eighties developers were razing a home to plant 3 in its place- or one hideous monstrosity that was completely out of proportion. New residents were attracted by the neighborhood's charm, then proceeded to do everything they could to destroy it. This ever increasing threat of teardowns continued throughout the Nineties, then area residents acted. Eventually Ranch Acres was listed on The National Register of Historic Places as a historic neighborhood in 2007, hopefully stemming the onslaught of McMansions. 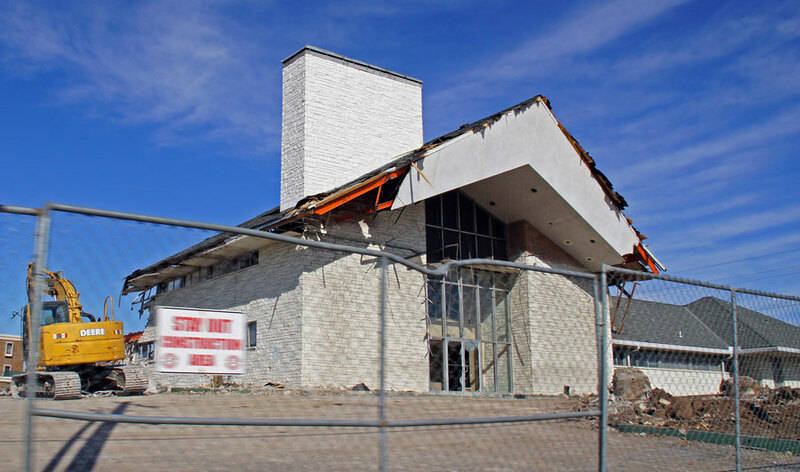 But sadly, the commercial components of this historic Tulsa area have not fared so well. 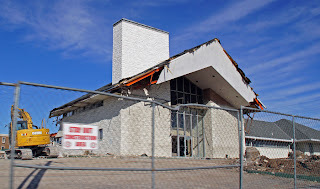 I was sad to see this beautiful building destroyed especially with the prospect of another Jack-In-The-Box or McDonald's setting up shop on that corner. To Walgreen's defense, they tried to use the existing structure but it was not adequate. At least we can still drive through the neighborhood and only see a few blights.